Casa de Abuela is a custom home especially designed for the rainforest. The bedroom wing has two bedrooms downstairs and two with private entrances upstairs. All have air conditioning and ensuite bathrooms. The great room has an island kitchen, large table that seats 12 and a TV/seating area. It is also air conditioned. The front porch is perfect for morning coffee while the hammock on the back porch is great for afternoon naps. The beach is a five minute walk from the property and has been designated as one of the cleanest beaches on the Pacific coast. It has natural jetties with tide pools that are great for children to explore. And there are several local surfing instructors for the more adventurous of you. The neighborhood was built 15 years ago and has primarily American and Canadian residents. Many live there most of the year and all are friendly and helpful. Manuel Antonio National Park is 45 minutes away. Zip lining, rainforest preserves, monkey tours and deep sea fishing are within a half hour drive. I built Casa de Abuela in 2005 not realizing what a risky venture I was undertaking. The entire adventure, however, has turned out to be a life-changing experience. So many things that could have gone wrong didn't and of the ones that did we managed to "make lemonade out of lemons" every time. My goal was to have a place where I could bring my children and grandchildren to experience one of the most one of the most beautiful places in the world. At this point, we all agree that Casa de Abuela has been that and more. I am retired and spend my summers at Casa de Abuela. The Pacific Ocean keeps the region cool at night and the rains keep it cool during the day. It is a beautiful Aarea of the world with mountainous jungles crashing into the majestic Pacific. 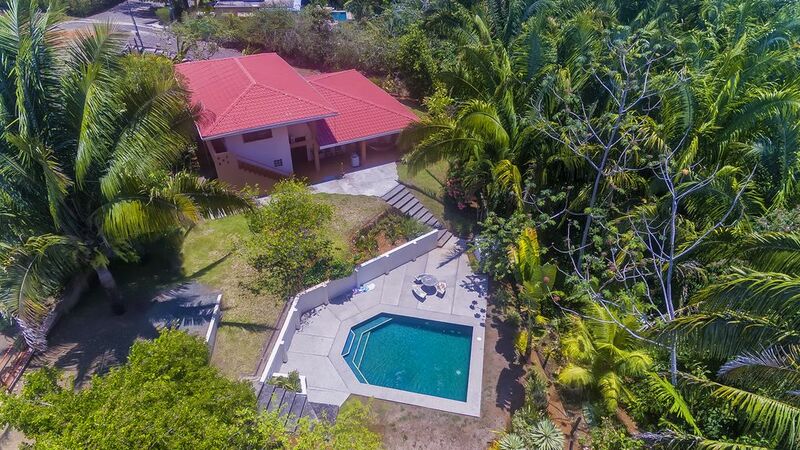 It is extremely safe, private and quiet in this community with great bird watching and the joy of watching the monkeys and other wildlife that live in the rainforest around the house..
Each bathroom is large and has a full-sized shower with sliding doors. Casa de Abuela has complete privacy and is located at the end of Calle Canada (named for all the Canadians that live on the hills above the village). Esterillos Oeste is a small fishing village with small grocery stores, bars, surfing shops and restaurants. Local telephone with long distance available. There are separate units in each bedroom and one main unit in the Great Room. All sheets are provided for up to 13 people. The neighborhood is very secure ensuring cars are safe parked on the street around the property. There is parking for FOUR cars only. All towels are provided for up to 13 people. Paper products are also provided. The living room is incorporated in one large living area with a comfortable couch and seating bench. There is a five-burner cook top on the kitchen island. Oven is large counter-top oven. All dishes and utensils are supplied. Large cooking island with stools encourages interesting conversation to keep the cook company. Large table made from Costa Rican cedar that seats 10 - 12 people. There is one TV in the great room. Cable TV is available with a few English-speaking channels. Large garden with beautiful plants and flowers. The first floor, which has living area and two bedrooms/baths, is wheelchair accessible. There is a large pool with Jacuzzi jets. It is located on the lower part of the property. Esterillos Oeste is a small non-developed village along the coast. It has a convenience store and two restaurants that we enjoyed while in town. The accommodations at Casa de Abuela are very comfortable. Plenty of room for a large group to have both a gathering place for meals, relaxation and game playing, as well as private spaces.. it has a lovely pool on the property that frames the evening moon. There is a table with chairs at poolside, but there are no lounge chairs. Although it is a quick walk to the beach, there is also access to the beach via car with use of a beach club accommodations. The beach is lovely, but beware of petty theft as our beach items we stolen ($, phone, car keys, etc.) on our day of arrival while swimming...leaving us a bit handicapped. Also be aware that the road leading to the house is steep, rocky and hard on a sedan car. The gated driveway has a deep decline into the driveway (similar to a concrete step) that makes it impossible to drive inside the property without damaging the undercarriage of a vehicle. We parked along the street. If renting a vehicle, I’d suggest and AWD SUV. Terrific spot for adults and kids. We had a group of 11 that was comprised of three families and kids ages 9-18. This house allowed each family to have some private space while offering a great central room for eating and socializing. The pool was perfect for cooling off, the AC kept sleeping quarters cool, the WiFi kept everyone connected and the property felt secure so there was never a worry about the kids running around. We saw monkeys each morning and there are iguanas running around everywhere. The laundry was a small washing machine so don’t expect to do a lot of laundry. There was a plastic, rolling cooler in the laundry room for day trips to the beach. Only a few minor complaints: TAKE TOWELS! There are no where near enough towels for 11 people to be in and out of the pool and showering even every few days. The final road into the property is very rutted and the gate has a cement block that you have to cross. Our 4 wheel drive SUVS had no problem but a passenger car might not make it unscathed. Finally, it would be nice if the owner supplied a few beach chairs. In all, these are minor inconveniences. This is a great property at a great price. This place is spacious and well appointed. It has everything you would need, with the exception of beach towels. We stayed here with 5 adults and 4 children under 6 years old. This house was absolutely perfect for our family. The pool was a Godsend for the little ones and they played in it for hours every day while we were taking a break from the beaches and excursions. The neighborhood is very quiet and safe. The property is a small walk to the beach. Others have stated you need 4 wheel drive to get to the preoperty but you certainly do not. The road is a bit rough but if you come from anywhere else than the city you have seen roads like this before. The management is fantastic! Felipe would make sure we were doing well and didn’t need anything. He ordered a crocodile tour for us and scheduled a massage that came to the house for us. The individuals who came to give us the massage were all locals who made the comment how beautiful the property was. We saw monkeys while drinking coffee on rocking chairs, macaws fly over us, iguanas were residents on the property which was fun for the kids, leaf cutter ants, and a coati which made two spot appearances for us. There is a lime tree by the porch which allowed us to have fresh limes for our drinks. They provide some bottle water for you to drink in the kitchen. Just to be fair, here is the constructive criticism: The outdoor grill was not working for us and the light over the stairs on the upstairs rooms were finicky and wasn’t working all of the time. However, if this is what our problems were, you can understand how wonderful our trip was. This was a nice location for my husband to host his company retreat while my young son and I, plus one other child in our group, could visit the beach during the daytime when the crew held their meetings. The house is at the top of a hill apart of a quiet neighborhood. It’s ideal having a vehicle that can handle the steep hill on a dirt road, but we did see smaller cars making it up the hill. We all loved being close to the beach to swim in the warm Pacific waters and to explore the tide pools, but it was a longer walk with the steep hill than we thought (about 7-15 minutes). At the house we all enjoyed the swimming pool, the two patio areas, and appreciated the large kitchen to make dinners at night. The house was clean and we were thankful for air conditioning in all the rooms to get respite from the heat and humidity. Just know to be sure to bring your own beach towels, coffee, shampoo & body soap. Many vacation rentals we’ve rented prior included these small details, but a quick run to the store at the bottom of the hill helped us solve that problem. There is a washing machine on site to use, but drying clothes is via clothesline. We loved having the resident Iguana’s entertaining us in the mornings on the roof. We also enjoyed the geckos in the evenings, watching cutter ants hard at work, and seeing occasional parrots and scarlet macaws flying overhead. We were surprised to have cattle visit us along two sides of the property while they migrated through rainforest to graze. Sadly, we didn’t see any monkeys. The community was welcoming, even when most of us didn’t speak Spanish very well. When we had an issue with our sink, the managers, Dave and Kate, were quick to respond and fix. Sadly there was a further issue with the same sink to be addressed, but since we were leaving the following morning, we told them we were okay with using another sink. We knew renting this property there was two bedrooms outside/upstairs from the main area of the house, but it was a bit disjointed for me. It would be more ideal if both of the downstairs rooms by the main area had the bunk beds with the double beds for the parents with kids, and upstairs had the two single bedrooms with the double beds for everyone else. Overall, we had a lovely time and it was great having a place in Costa Rica where some of our group could bring our young children, and the others in our group could work, but all of us could experience a little Pura Vida. So glad you had a great time. And thanks for the feedback. Very nice common area and swimming pool. Went there with the family (children included) and had a great time. So glad you had a great time. Looking forward to having you again. Other sights in Costa Rica about four hours from Esterillos Oeste: Arenal Volcano and Hot Springs, Monteverde Cloud Forest, Resplendent Quetzal National Park, Nicoya Peninsula, Guanacaste, Puerto Viejo on the Caribbean coast. There are many exciting things to do from Oeste, all within an hour or less drive from the house. For example, you can go to Manuel Antonio, one of the finest national parks in CR, go white water rafting, ride the 'zip' lines over the rain forest, go deep sea fishing, or take a monkey tour in a mangrove swamp. And best of all, the road to and along this part of the coast is good all the way from San Jose to Esterillos Oeste and Quepos, a very important fact in a country where many roads are dirt and require a 4-wheel drive vehicle. $300 will be held as security deposit and is completely refundable once the property has been inspected.